It is a musical which the creative team at Kilworth House Theatre say will leave you grinning from ear to ear. And rehearsals for Kiss Me Kate, which runs from Wednesday, May 31, to Sunday, July 16, are underway. Set in 1940’s Baltimore, it’s opening night. There are just 10 minutes to the curtain going up and backstage all hell has let loose! The story unfolds on and off stage as romantic entanglements, mistaken identities and hairy encounters with a pair of hilarious, foolhardy gangsters are all comically intertwined in Cole Porter’s stunning musical comedy. Another Op’nin, Another Show, Brush Up Your Shakespeare, Too Darn Hot and So In Love. Producer Celia Mackay, who is once again joined by director Matthew White, has assembled a cast of experienced musical theatre performers. Playing Fred Graham is Matthew McKenna while Caroline Sheen will portray Lilli Vanessi. Justin Thomas plays the part of Bill Calhoun. 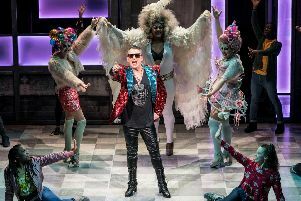 Other cast members include Cory English, Carl Sanderson, Gary Davis, Andrew Gordon-Watkins, Piers Bate, Davide Fienauri, Tarinn Callender, Craig Turner, Adam Philpott, Paul Hutton, Thomas Audibert, Emily Squibb, Holly Willock, Katia Sartini, Helen Turner, Molly May Gardiner, Tash Holway, Jessica Pardoe and Laura Ellis. Kiss Me Kate is the first of two musicals to be staged at the venue during the summer months. The other will be the song and dance extravaganza Top Hat, which has received critical acclaim during both tours of the UK and in the West End. It features music and lyrics by Irving Berlin. Tickets for the show cost between £32 and £40 with a number of performances throughout the six week run. Demand for the tickets is likely to be high so people have been advised to book as soon as possible to avoid disappointment. For further information or to book tickets in advance call the box office on 01858 881939 between 10am and 4pm Monday to Friday or online at www.kilworthhousetheatre.co.uk.